There’s about a million faucets to choose from and all kinds of different shapes, sizes and features. Plus, choosing the right kitchen faucet is critical! Think about how often you use it, and you’ll see what I mean. Sure, you want one that looks good, but you also need it to function properly and efficiently. 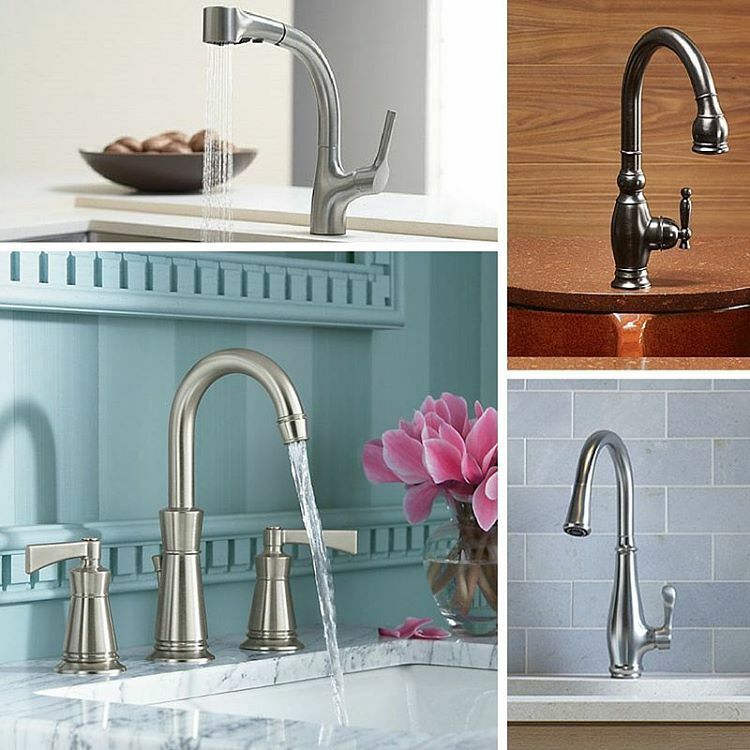 In this post, you will find a comparison of the 5 top rated kitchen faucets to make it easier for you to decide which one you should buy for YOUR kitchen! 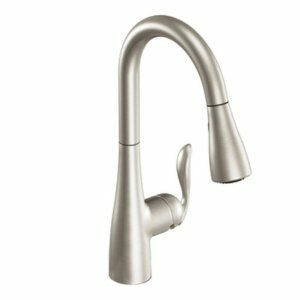 I discovered that you can’t just leave this as an afterthought, so I really dug in and researched what kinds of features make the best kitchen faucets in order to figure out which ones I needed for my kitchen and then compare some of the faucets out there to see which one would be the best buy for the money. Oh yeah, and don’t forget the customer reviews – I looked at those too. I mean what better way to figure out if the faucet really works like they say it will then to find out what other buyers have said about it? Arc – This refers to the “arc” of the faucet itself. It’s key to get one that has a big arc so you can fit your big pots under it! Swivel – How far does the faucet swivel to each side? You’ll want one that has a large range so you can swivel it to reach the edges of your sink, especially if you have a large sink or double sinks. Spray Wand – I discovered that the best kitchen faucets have the spray wand as part of the faucet (as opposed to as a separate hose), so I only included models that had that in my research. There are a few things to consider with the sprayer itself, like the length of the hose (longer is better) and how easy it is to take out, retract, secure into place and maneuver. Lever – Some kitchen faucets have two levers, but I prefer the one lever that controls volume as well as temperature. These are easier to use so all the models below include that feature. Ease Of Install – Kitchen faucets can be frustrating to install, so this is one of the things I looked at when researching faucets. Easy To Clean / Finish Warranty – Who wants to spend time cleaning water spots from their faucet or digging gunk out from around the fittings? I know I don’t and you probably don’t either so I looked into how easy to clean each faucet was as well as any information about how the finish would hold up. 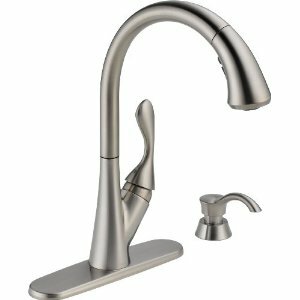 The Moen 7175 Level One-Handle High Arc Pullout Kitchen Faucet is my number one choice as the best kitchen faucet for several reasons! First of all, it looks great. It has a very sleek, modern design with a single hole mount that makes for great look on the counter top. I like the shiny chrome look, but you can also get it in a less shiny stainless finish to match your stainless appliances. Price – This faucet is actually one of the least expensive ones I researched, but that’s not why it’s rated 1. 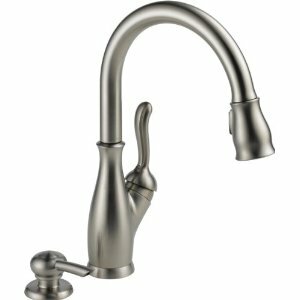 It has a lot of extra features (listed below) that the other faucets don’t have and that combined with the price and customer feedback make it the best choice for a kitchen faucet in my book. Hydrolock Fast Installation – this is probably one of the best things about this kitchen faucet because installing these can really be a pain! The Moen 7175 has a patented quick connect system that makes install a breeze – no other brand of faucets has this! Reflex Technology makes the sprayer wand easy to use allowing for easy docking, maneuvering, extension and automatic retraction and docking without assistance. The 68 inch hose is very flexible and the spray wand swivels for a wide range of motion. According to testing, the sprayer on this model is 40 percent easier to unlatch and extend when compared to other pull down faucets. Has a high arc spout that allows for even the largest pans to go underneath and one lever handle that can install on either side and rotates 100 degrees for ease of use. Pause feature stops spray of water so you can pass the want over the counter from pot to sink without spraying the counter. 24″ long spout can deliver up to 2.2 gallons per minute (at 60 PSI) and operates in spray or stream mode. LifeShine non tarnish finish will never wear off – guaranteed not to flake, corrode or tarnish for the life of the faucet. Another Great Faucet – This one Is 2 On My List. 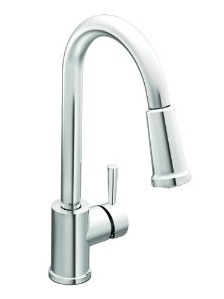 The Delta 9178 SS DST faucet comes in a close second as one of the best kitchen faucets you can buy. It has a great look, and magna tight docking but falls short on the easy installation. Looks sleek and stylish – has single lever and comes in 3 finishes – chrome, stainless and venetian bronze. Magnetic docking system clips pull down sprayer into place tightly and easily (this feature gets great customer reviews). High arc faucet swivels 360 degrees giving you access to the entire range of your sink. 59″ sprayer hose extends for 20 inces (this is slightly shorter than the Moen faucet that was my #1 choice). Diamond seal technology keeps water inside the faucet, so it doesn’t come in contact with metal, and is rated for 5 million uses. This one Rates a Close Third. 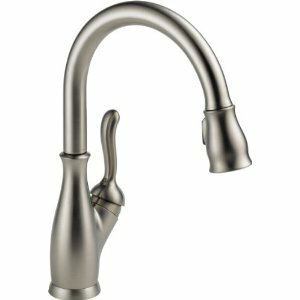 The Moen 7594 CSL Arbor One-Handle High Arc Pullout Kitchen Faucet comes pretty close to my number one choice, but is a little higher in price, otherwise I might have chosen this one. Plus, I liked the “look” of the other model better – it was a sleeker and more modern design. Otherwise, they have almost the same features – this one got slightly less stealer reviews (see below). Classic design comes in stainless and chrome. Hydrolock Fast Installation lets you hook it up to the water lines with one snap. Reflex Technology makes the wand easy to use. Docking is easy and the hose is easy to manouver. The 68 inch hose is super flexible and returns to the docked position without assistance no matter where you have positioned it. The high arc spout lets you fit even the largest pot underneath the faucet. Three function sprayer has continuous aerated stream, pause and powerful rinse. LImited lifetime warranty against leaks, drips and finish defects. Escutcheon included for 3 hole installation. 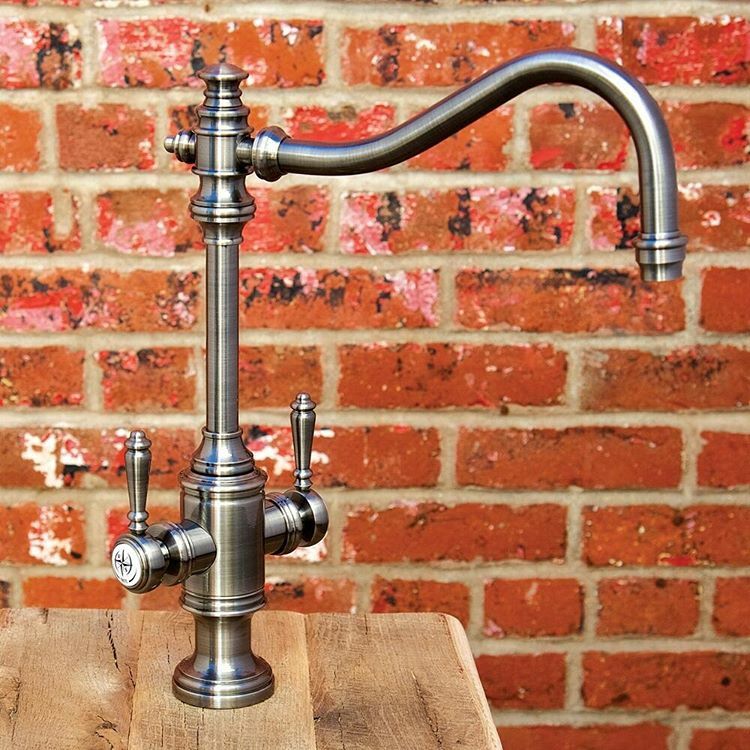 Comes in at 4th in our list of best kitchen faucets. The Delta 19922 SSD kitchen faucet only comes in at number 4, but it does have a unique feature the others don’t and that is that it comes with a matching soap dispenser. Of course, this only matters if you actually want a soap dispenser, personally I find them to be a pain to keep full so I never used the other one that I had with my old faucet. Single lever control is easy to use (according to customers) and faucet has a nice, sleek look. LIke all the Deltas, this one has the magnetic docking system which clips the pull down sprayer into place tightly and retracts the hose without assistance. High arc faucet swivels 360 degrees which allows you to put even your big stock pots underneath it. Diamond seal technology makes sure the water lines stay sealed properly. Multi flow fachet want allows you to temporarily increase water flow to 2.0 gpm. Finish and faucet lifetime warranty included. The Delta 19978 SSSD Leland faucet is the final one that I found to be least impressive during my quest to find the best kitchen faucets, but it was also the least expensive. It has many of the same features of the other Delta faucets, I just didn’t like it as much. Has a high arc faucet, single lever controls and the matching soap dispenser is included. Has Delta’s magnetic docking system which makes the wand easy to retract and clip in place. High arc faucet will swivel 360 degrees so you can easily reach the entire sink area. The sprayer hose is 59″ and will extend for 20″. It is easy to maneuver, extend and retract. This faucet also has Delta’s Diamond Seal technology which keeps the seals closed and your water inside the housing instead of leaking out of the faucet. Faucet includes a lifetime warrenty on the faucet and finish. Hose Length – The longer the hose, the more you can do with it. A longer hose allows you easier maneuverability. Both the Moen models reviewed in this article have a longer hose than the Deltas. Ease of Use – You want the hose to be easy to use, you want it to retract and dock easily without you having to struggle to get it in. You also want the hose to be easy to maneuver. Looking at the customer reviews for all of these kitchen faucets, it looks like they all meet this requirement. Ease of Installation – If you want to install it yourself, you want something easy and the Moens offer the easiest install. That being said, installing a faucet is never really that easy, so maybe hiring a plumber is a good way to go. Style – When it comes right down to it, you want a faucet that functions well but that also looks good in your kitchen. That’s the thing that really tipped me towards the Moen 7175 – I loved that sleek look. It’s more modern than the others but you might have a totally different “look” going in your kitchen and another model might suit you better. Truthfully, any of these models would be a good choice, read the customer reviews and compare the features to help you make your decision. 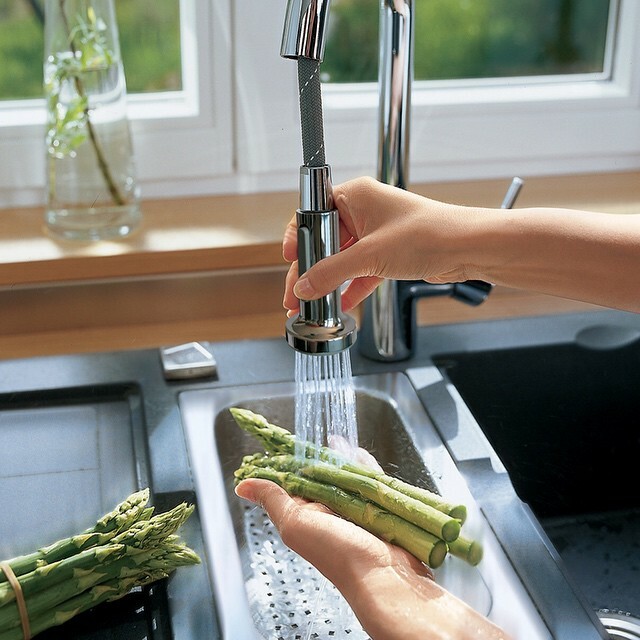 I hope this article has helped you pick the best kitchen faucet for your family! When remodeling my kitchen, I didn’t realize there were so many things to consider when looking for a faucet. I did a ton of research to find out which would be the best value for the money and I’m sharing that here. You’d think picking the best kitchen faucet would be easy, at least I thought it would be. I just figured you’d go into the store (or look online) and pick one you liked. Boy, was I wrong!